There has been a crossing close to this point, between the City of London and Southwark, since the time of the Romans. Many of these timber bridges were constantly rebuilt and replaced throughout the years. 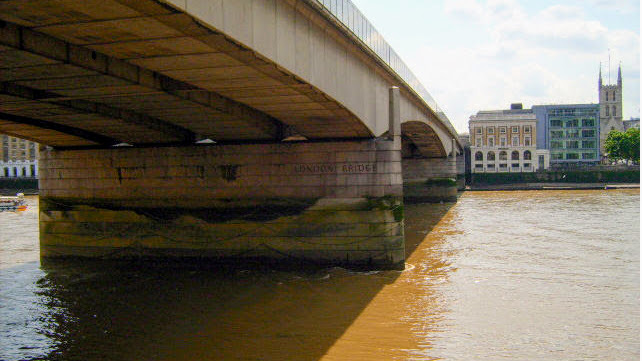 When the Romans deserted Londinium the bridge fell into disrepair and wasn't rebuilt, until around 990. This bridge was destroyed in around 1015 and would not be rebuilt until 1066, when King William I had it rebuilt. In 1091, the bridge was severely damaged, along with other parts of the City of London, when a tornado struck the city. It was repaired, yet again, only for it to be destroyed by fire in 1136. The bridge would once again be repaired, in timber, in 1163. King Henry II commissioned the first stone London Bridge in 1176, which was completed in 1209. This new bridge was 8m wide, almost 270m long and supported on 9 arches. A drawbridge, in the middle, allowed for ships to pass along the river. There were also defensive gatehouses, at either end. By the mid 1300s there were over 130 shops lining the bridge. A chapel, towards the centre of the bridge, called the Chapel of St. Thomas on the Bridge, became the starting point for pilgrimages to Canterbury. With many of the buildings, on the bridge, made of wood they were a major fire hazard, many of which were destroyed in 1212, when a fire spread along the entire length of the bridge. The houses on the bridge were also destroyed during the peasants revolt, 1381, and, again, during Jack Cade's rebellion, 1450. In a twist of fate, a fire that destroyed the northern end of the bridge in 1663, formed a firebreak that stopped the Great Fire of 1666 from spreading southward. By the mid-to-late 1500s the bridge had become so congested with traffic, which was down to two lanes both under 2m wide, that it was sometimes quicker to take a ferry across the river. This was providing the river wasn't frozen over, or that the rapids, caused by the 9 arches, weren't too strong. To ease congestion the Lord Mayor decreed, in 1722, that all vehicles would travel on the west lane, when approaching the city and on the east lane, when heading to Southwark. This could be from where the idea of driving on the left originated. Between 1758 and 1762 an Act of Parliament allowed for all of the buildings, on the bridge, to be demolished. This made it possible for the two centre arches to be replaced with a single, wider arch that aided navigation of the river. With the bridge being over 600 years old, a competition was held, in 1799, to design a new bridge for a new era. Many designs were put forward, but it was John Rennie's design of a stone-arched bridge that won the day. Construction began in 1824 and was completed in 1831, when the old bridge was finally torn down. In 1896 more than 900 vehicles and 8,000 pedestrians used the bridge every hour, which had a damaging effect. The sheer weight was causing the bridge to sink into the river. By 1924 it was decided that the bridge would need to be replaced. In order to cover some of the cost of a new bridge, it was decided to sell the old one. Robert McCulloch purchased the bridge and had it dismantled and shipped to America, where it was rebuilt in Lake Havasu City, Arizona. Construction of the new London Bridge began in 1967 and took five years to complete. It was officially opened by HM Queen Elizabeth II, on March 17, 1973.